Today’s blog post is a shout out to the one and only, Breeze’s Grill. Breeze’s, located on the Bass River in New Gretna, NJ, opened a little over a year ago- and for me it was love at first bite… or maybe it was love at first sip. I’m not sure which came first but either way, since they opened Jim and I have been regulars there. For us, Breeze’s is literally a 3 minute drive or in most cases a 5 minute boat ride from our home. However, even if you aren’t local it’s well worth the trip. It’s definitely more than the convenience that keeps us going back…. The atmosphere is nautical and laid-back. Whether you are seated on their large outdoor deck at a table under a white Malibu Rum umbrella or on the resort-style furniture you’ll feel like you’re in the tropics. Also, their staff is youthful yet personable, friendly, and serviceable. Trust me, after only a few visits you’ll be on a first name basis with everyone from the servers and bartenders to the cooks to even the manager. And, I can’t fail to mention their menu which consists of all your favorite bar bites plus a great variety of fresh seafood. My favorites include the Scallop Kabobs, Oysters on the Half Shell, and Flying Pigs. These dishes are only to be topped by the superb cocktails they offer. This here is Laurel’s Shot. It’s delicious! 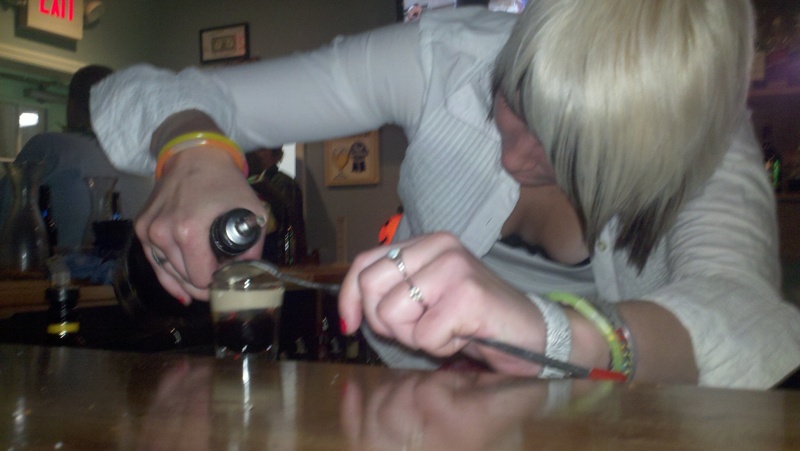 She layers Kahlua, Buttershots, and Bailey’s to make one hell of a shooter. It looks like a miniature Guinness, but don’t let that fool you, it tastes like a candy bar! Using the back of a spoon, layer liqueurs into shot glass beginning with the Kahlua and ending with the Bailey’s.